Shelby is as sweet as the day is long. 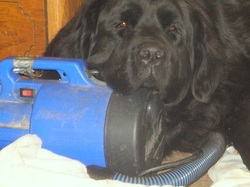 She is the epitome of Newfoundland temperament. Shelby is a girl of considerable size and substance. Shelby is a Stormy daughter and true to form, she also possesses beautiful balance with the clean movement that her dam gave to all her offspring. Unfortunately, Shelby's promising show career was cut short by major (mine) life changes. Shelby turned 9 on January 2nd, 2011. Her retirement activities include holding down the furniture, attempting to rid the yard of squirrels and chipmunks and taking regular swims at the pond. She may also be doing some therapy work in 2011. Sadly, we lost our sweet Shelby just a few months shy of her 11th birthday in October of 2012. RIP sweet girl. Shelby at 18 months. 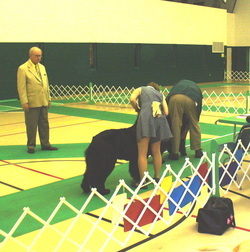 First point & BOB at Tri - City KC under judge Booxbaum. The only thing Shelby loves more than food is her 'dad'. Kathy & Shelby waiting to go in the ring. 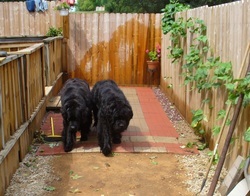 Shelby and Sailor taking an inspection tour of the partially finished new patio. 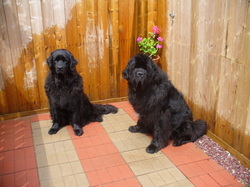 Copyright © 2010-2011 Moonsail Newfoundlands. All Rights Reserved. 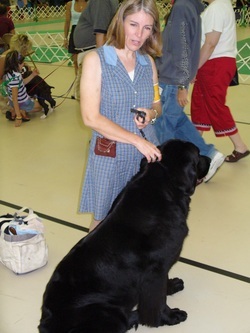 All graphics and objects contained on this site are the sole property of Moonsail Newfoundlands and should not be used or copied without prior approval. 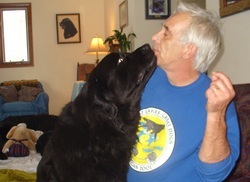 Disclaimer: Acceptance and use of the information contained on this web site constitutes an acknowledgement that the user hereby releases and indemnifies Kathy & Steve Van Wie & Moonsail Newfoundlands from any and all liability and damages sustained by the user as a result of any information obtained from this web site. 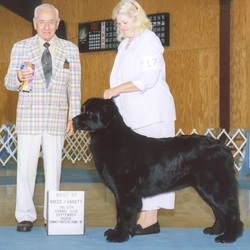 This web site is owned by Moonsail Newfoundlands.